Everyone seems to be winding down from the last fight Cap had to endure against the Iron Nail. S.H.I.E.L.D. can't be trusted by anyone, shocker, Steve has had the very youth sucked out of his body. Its a very bitersweet issue. Lots of emotion coming from everyone involved. Nothing screams convenience though, like a giant portal opening up and Arnim Zola's (yes, we thought he was dead too) entire castle and army of minions come through and start attacking New York after the fight Cap was already preoccupied with. YAY plot movement!!! A good amount of this issue is spent in Cap's room with him, Nic Fury and Maria Hill. Cap is seeing on the news different developments about S.H.I.E.L.D. 's super weapon which Steve was forced to destroy last issue. Well, it turns out its in a secret location being fixed. This pisses Cap off to no avail, he had his youth taken away and basically, his powers are gone. All for what? To know the very thing he had to stop can just come back for "just in case" matters. Yeah, it wouldn't sit right with me either. Also, side note. Jet Black and the Falcon are totally hooking up thanks to cheap wine! She's actually the one to notice the attack on Times Square and immediately recognizes that the tower and army belong to her father. We see Arnim Zola at the helm of his ship/tower thing talking to the dreaded Red Skull and his deadly S-Men. We learn that Zola has some tricks up his sleeve and is very confident that he doesn't work FOR the Red Skull, but WITH him. They both need something from each other, so I'm stoked to know Zola is gonna get wrecked later since remember Skull has the powers of both Charles Xavier AND Onslaught. I know, it can get tough, keep up with me here. Steve makes his way to gather the Avengers as the attack on New York continues but he's only able to find Thor, Iron Man and the Hulk. But that may just be more than enough for them. Everyone's got their secrets, and there's something that only Rogers and Banner know, purposely keeping it from Tony, but I'm sure it'll all fall into the plan later in another couple issues. The Avengers have Assembled and nothing is going to take their home city from them. 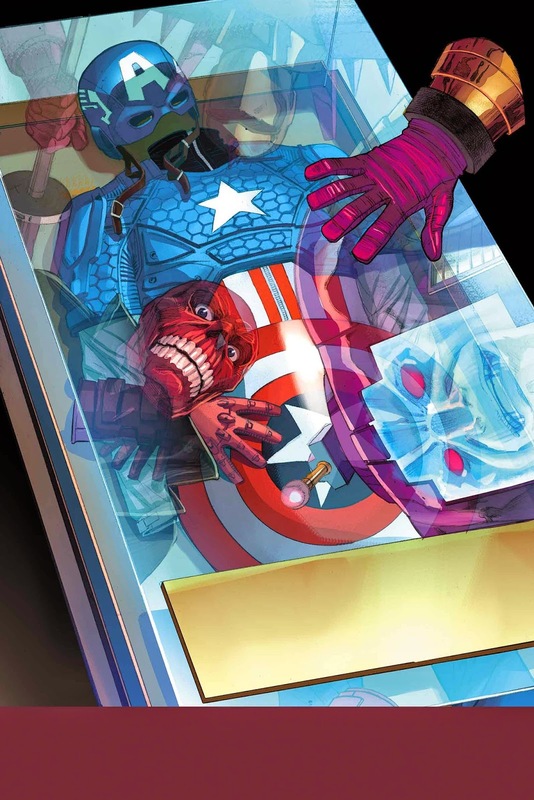 Remender is setting himself up for another big arc and there's only one question on my mind, how the hell is Captain America going to get himself out of this one alive?! He's old, tired, weak, and Marvel has even confirmed that someone else is going to be picking up the shield for a bit. But who will it be this time? And what does that mean for Steve Rogers seeing that he'll be alive for this rotation? My money's on a winged helper, but we'll just have to wait and see. I really liked this issue, there wasn't a lot of action but it truly build up the plot in a great way. We also get to see that even in old age, Steve is still passionate about the things he loves and believes in. I'm anxious to see where this is going to end up, seeing that Zola was supposed to be dead and left behind in Dimension Z. I wanna know how the hell he's alive, how the hell he made it to earth and how the hell don't all these books that feature all these heroes clash with each other?! Ok so maybe that last one isn't something that Rick can answer for me, but a boy can dream. Until next week!